He said, “It would be miserable not to have a hard life because I would be so distracted by good things.” Distracted from people, from the needs of others, from truth, from life, from God Himself. 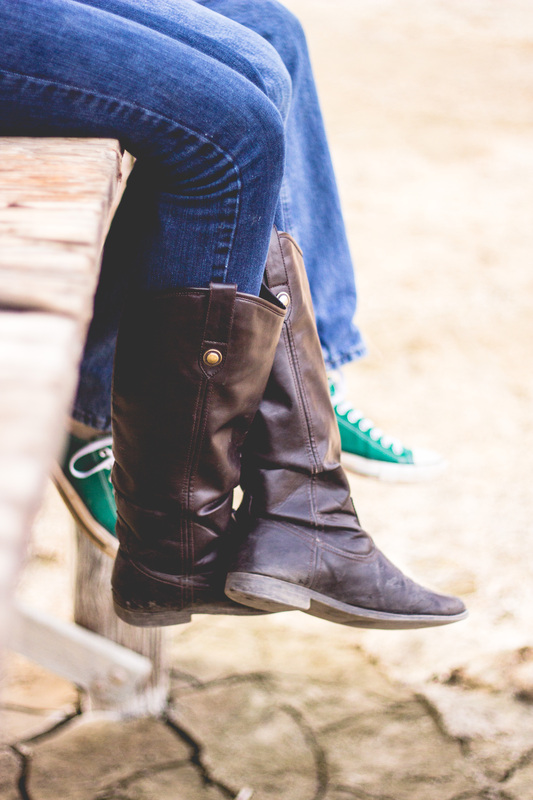 My husband uttered one sentence that began the jumbling around of thoughts in my mind. We run from disappointment and sorrow, but it’s a part of living in a sin-cursed world. While living here, we can’t avoid it. As children of God, we long for heaven, complete righteousness, uninterrupted joy, hope realized, and direct fellowship with our Savior! The longing for these things is good. But we have to live here on earth first, and I’ve begun to learn that sorrow doesn’t have to crush me with its weight. For it is sorrow that bridges me to Jesus, and heartaches that bring me wide glimpses of hope! It is weakness that has me running to God, and disappointments that bring my tears to His comfort. It is my shattered dreams replaced by God’s better desires, and my ever present insufficiency that makes me realize His perfect strength. While on earth, it is often the hard things that reveal the love and sovereignty of God! We fight the hard things, but the hard things have a way of pushing us to God. The way is painful, but the end is HOPE. He said, “It would be miserable not to have a hard life because I would be so distracted by good things.” I agree with my whole heart, and the longer I’m married….I am ever more thankful for God in the hard things. I don’t wish them in our lives or drown beneath the weight, but a marriage cannot and will not escape the hard things. We will be broken, but not shattered as hard things squeeze between the crevices of life and demand to be addressed. We pick up the hard things and we hold them together. We lift joint voices before God and ask for His strength and grace. Those hard things become good things, and they are better than the good we’d have wished for ourselves! Today, I’m thankful for God in the hard things. The more I love my husband, the more imperfect it all becomes. The world lies to me and tells me that the flaws magnify the beauty of our love, but I know it isn’t so! The flaws—the ugly, deep flaws—magnify the realness of God’s love! Those undesirable hard things rip out the obsession we have with ourselves, and make us join together in God’s comfort & grace over and over again. There is sweetness in sorrow and hope in suffering. Marriage means we live the hard things together, and isn’t that lovely? 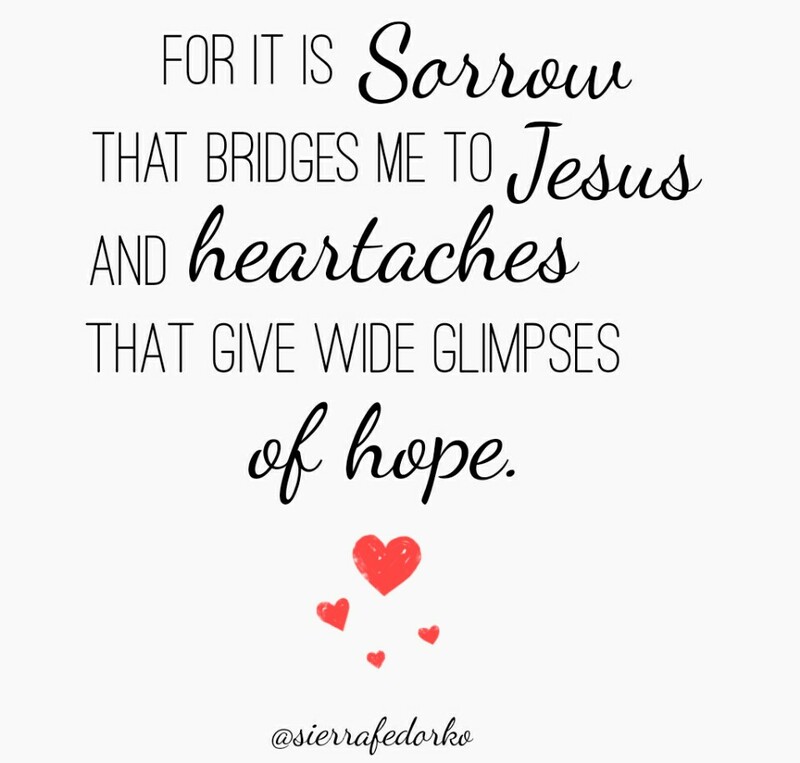 Because sorrow bridges us to Jesus, and heartaches bring us wide glimpses of hope! It is weakness that has us running to God,and disappointments that bring our tears to His comfort. Shattered dreams are replaced by His better desires, and our ever present insufficiency forces us to realize His perfect strength! Don’t mistake the hard things of marriage and life to be a vain and hopeless cause for suffering. There is hope in hardness when hardness is surrendered to the loving hands of God. It may not be beautiful to us, but the life mosaic He is creating will be breathtaking. Not because of our cut and jagged piece in it, but because He put us there in His love and sovereignty. It is beautiful because He places us. Both good and hard things will be part of this life mosaic, but never mistake hard for hopeless. Never mistake our perception of ugly, for God’s reality of beauty. Pick up those hard things. Feel how they weigh you down? Throw them at God’s feet and trust Him with your heart. Hard things become a vessel for hope when we surrender to God, and surrendering brings a steady peace and genuine joy that could not be realized with heaps and heaps of painlessly good things. And so today, I’m thankful for God in the hard things. Thank you for your encouragement, grammyann!